To make your life and that of your pets as stress-free as possible, proper flea extermination is a must. Summer is here and unfortunately; it brings along a lot of flea activity. There is one tried and tested method employed by many pet owners to get rid of fleas: Vinegar and dawn dish soap solution for fleas. I take a closer look at how you can get rid of fleas with vinegar and Dawn dish soap. One way to win the war against fleas is to add a few drops of vinegar to your pets’ drinking water. This has the effect of repelling fleas as the pet’s skin and blood become too acidic or unpalatable. However, never attempt this method on your cat as it can tolerate the acidity levels. If your pet doesn’t like the taste even after lowering the amount of vinegar added to their water, don’t despair. You can buy a vinegar capsule online. You and your pet will definitely love it: your pet and homestay flea-free and as an added bonus, it boosts the pet’s immune system and also acts as a deodorizer. – Dawn Dish Soap, – Vinegar, – Flea comb, and – Bowl. Step 2: Add ½ to 1 cup of Dawn soap depending on whether or not you are using a concentrated product and the amount of water in the tub. Step 4: Lather and clean it starting from the ears all the way to the tail. Step 8: Add ½ or 1 cup of vinegar to the solution. Step 9: Use the flea comb again to groom your pet while consistently dipping it in the homemade dawn dish soap and vinegar solution for fleas. To make sure that you have completely eradicated fleas and their eggs in and around your home, it is essential to do some ‘cleaning’ with Dawn dish soap and vinegar for fleas. This is because fleas also live on your furniture and carpet, reproducing and leaving unwelcome flea debris. You’ll need to first brush up dirt from your carper before starting the treatment process. Then, pour the dawn dish soap and vinegar mixture on and underside of your carpet to ensure you kill all the fleas. You need to adopt a comprehensive approach to get rid of fleas. If you treat your pet and home without treating your yard using the best flea spray for yard, you will hardly notice any change as new fleas will hatch and recolonize your living spaces and pets. Your target should be live fleas as well as their eggs, making sure to inspect your yard and repeat the process every 10 days. The first thing you need to do is to make sure that the sun and your spray are both able to reach the ground where the flea eggs are located. To achieve this, mow your lawn to between 1 and 2 inches. Now take the hand-held sprayer that you will use to apply the homemade flea spray with Dawn dish soap and fill it with water. Add 1 oz. of Dawn dish soap, replace the cap, and shake to make sure the solution is mixed well. Lastly, it is time to apply the vinegar flea spray to your whole yard. The best time for you to do this is during the evening, as it gives the detergent enough time to get to work before the sun comes out. The heat from the sun dries the solution and compromises its effectiveness. After the first treatment, check your lawn the next day to establish if the flea eggs have been successfully terminated. If you still notice evidence of flea activity, repeat the process until all flea eggs are annihilated. Pour the vinegar flea insecticide along all your home’s doorways. Make sure to create thick lines to better your chances of keeping the bloodsuckers out of your home and away from your family and pets. Fleas are parasites that live entirely from sucking the blood of a host (hematophagy). They are wingless insects belonging to the Siphonaptera order. The more than 2,000 species have evolved to favor specific hosts, such as dogs, cats, rats, birds, and humans. The danger posed by fleas is evidenced by the fact that the vast majority of the pet care industry deals with the extermination of fleas and preventing them from taking residence. A female lays up to 1500 eggs in her lifetime, which is roughly 50 per day. This means that if you don’t take action on time, you will end up with a huge flea population terrorizing you and your pets. – Flea bite dermatitis (allergy to flea saliva), – Tapeworm, – Flea bite anemia, – Plague (can spread to humans), – Cat scratch fever (can spread to humans). There are 3 ways to detect if you have a flea problem. Simply seeing your pets scratching does necessarily mean that you have a flea problem on your hands, and the reverse is also true. Comb your pet with a flea comb onto a white paper. If the paper catches some black flecks, wet the paper and see if they turn to red. If they do, it’s an indication that its flea dirt and you have an itchy problem on your hands. Put on a pair of wet white socks and walk around your pets’ play or resting area. Remove the socks and check for black specks which react the same when exposed to water. If they are present, you have a flea problem on your hands. Prepare a soapy water and vinegar solution in a bowl and place it next to a light. Leave it there overnight. If you observe drowned fleas in the morning, you have a flea problem. There are a lot of chemicals on the market for getting rid of fleas. However, it is inadvisable to resort to these products as they can be harmful to pets and their humans. Most of the products are designed specifically for one type of animal and may be harmful if used on a different species. One good example is dog products containing permethrin, which is dangerous to cats. This brings us to vinegar and Dawn dish soap: There are many ways you can use vinegar and dawn dish soap to control flea activity. Vinegar has been a cleaning and deodorizing solution for centuries. It enjoys many uses around the home and you may have used it at some point such as in the kitchen to beat ant and fruit fly invasions. All types of vinegar will work to get rid of fleas, although some people have their preferences between white distilled or apple cider vinegar. You could try using apple cider vinegar on your pet and keep the home safe using white distilled vinegar. One of the many uses of Dawn dishwashing soap is fighting fleas. Dawn soap disrupts the flea’s exoskeleton and breaks down cell membranes. It also stops the insect’s waxy cuticles from repelling water, effectively drowning it. This fact is also supported by the University of Florida IFAS Extension website. 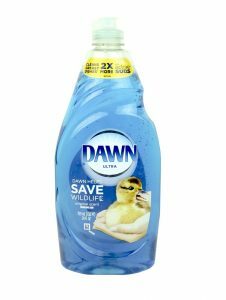 1: Dawn Dishwashing Liquid Original Scent, 21.6 oz. (3 Pack) This is one of the best selling liquid dishwashing soaps in the US. The brand needs no introduction and this specific product boasts a distinct refreshing scent and unmatched grease fighting power. It is a multipurpose liquid soap that is best for shampooing your furry friends and getting rid of fleas. If you need some convincing, you will be glad to know that rescue workers use it to clean rescued birds during oil disasters around the world. You can also bank on its long-lasting bubbles for a job well done. It has a massive 708 reviews on Amazon from satisfied customers. One way to do this is regularly treating your yard. Also, remember to keep a bottle of vinegar flea spray handy for use on your pet between baths. Search the internet for other creative and effective ways to use Dawn dish soap and vinegar for fleas. You can also use Dawn dish soap for fleas on puppies and kittens.